The project began with Thomas Jefferson's library, which a small group of volunteers began cataloging in September 2007 (and is currently being enhanced and maintained by librarians at Monticello). Since then, more than 150 additional Legacy Libraries have been completed, with another 50 currently in progress and many more proposed for later addition. 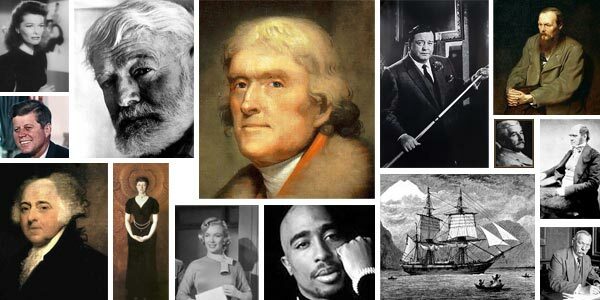 Subjects include everyone from Samuel Johnson to Marilyn Monroe, Carl Sandburg to Marie Antoinette. Once the libraries have been entered into LibraryThing, it's easy to see how Legacy Libraries compare with your own, or with each other. In September 2008 we launched the Libraries of Early America project, an effort to create as comprehensive as possible a database of early American private libaries through 1800, including those libraries about which we may not have complete bibliographic data (like those frustrating probate inventories which say things along the lines of "A Quantity of Books"). Data on more than 1,500 early American libraries have already been entered into the database from a wide variety of sources, with a huge number of libraries still to be added (and submissions always welcome). For each, we provide all known information on the library, as well as certain demographic elements (birth/death dates, places of residence, occupations, any particular provenance marks the person is known to have left on his or her books, and more). Do you have additional information about any person or library listed here? Or about another person's library that should be added? Are you interested in helping out with a Legacy Libraries project? Join the Legacy Libraries group on LibraryThing, or start with the Cataloging Guide. Feel free to contact Legacy Library coordinator Jeremy Dibbell (jeremy@librarything.com) with questions or information at any time. Submissions of library data are always welcomed and appreciated - we know there's a long way to go, but every new entry adds a little bit to the whole, so keep them coming!